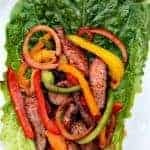 6 Delicious, Quick and Easy Low-Carb Paleo Recipes For Dinner are perfect for the Atkins diet, keto, carb cycling, meal prep, and an overall healthy lifestyle. Wash and trim the fat from the steak. Pat dry. Pour ½ tablespoon of soy sauce on each side of the steak (1 tablespoon total). Combine the seasonings in a bowl. Sprinkle the seasonings on both sides of the steak. Place the steak in a Ziploc bag. Add 1/2 tablespoon of soy sauce to the Ziploc bag. Seal the bag, removing all air. Pat the outside of the bag to ensure added soy sauce saturates the meat. Place in fridge to marinate 4-6 hours. Grill steak to preferred doneness (i.e. medium). OPTIONAL: To ensure a tender, juicy steak, melt 1 tablespoon of grass-fed butter in the microwave for 30 seconds and stir. After the steak has reached the desired doneness, using a cooking brush, brush the butter onto both sides of the steak while it’s on the grill. Remove the steak from the grill and allow it to cool for 5 minutes. Place the steak horizontally on a cutting board, and slice steak into pieces. Chop red onion, garlic, and peppers. Spray a pan with cooking oil and add the veggies on medium heat. Allow to cook until garlic becomes fragrant. Add the Sriracha and allow it to cook for another 2 minutes. Remove from heat and allow to cool for 2 minutes. Use your judgment here. If you add the steak too soon it will continue to cook the steak. Add the steak slices and stir to combine all of the ingredients. Spoon the mixture into the center of a lettuce leaf.